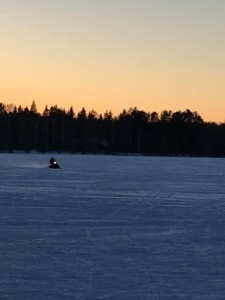 X-Skiing, Snowmobiling and Ice Fishing Conditions are Perfect! Family day on the trail! 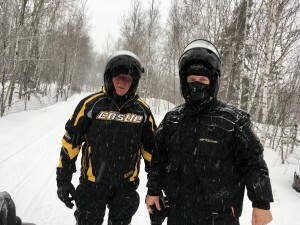 We finally made it out for a short snowmobile ride this week. Tuesday we took Jay’s dad out on his new snowmobile and had a great time. This is his first winter at Wildwood and he hasn’t been too happy about the frigid temperatures. He fails to see the beauty of winter when his front door is frozen shut! However, he did buy himself a nice sled and good gear so we were excited to get him out on the trails. 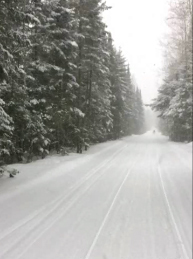 It was snowing Tuesday and the Bushwacker Trail and the Taconite Trail had not yet been groomed after the weekend. Although there were some spots with moguls overall conditions were almost perfect for our short ride. (According to today’s trail report both trails have been groomed.) We headed east from the resort and the went a short way up the Taconite. Our time was limited so after an hour or so we turned around and headed back to Cohasset for lunch at Florio’s. I love that we have a nice restaurant and a Casey’s so close to Wildwood! Jay’s dad did great on the trail and it was so fun to see him experience his first ride. Finally he caught a glimpse of winter’s beauty! Travel on our end of Bass Lake is easy these days with good ice and not a lot of snow. Ice fishing is picking up, too, judging by the number of people out on Bass Lake over the weekend. We had a large group of fishermen in and they caught plenty of sunfish and a few crappie in spite of the cold temps. Ice is approaching 16″ on our end of the lake so the extreme cold has some up side! Winter is here to stay for at least a few months so why not get out and enjoy it?! We still have prime winter openings for your winter getaway so feel free to check availability and give us a call or email! 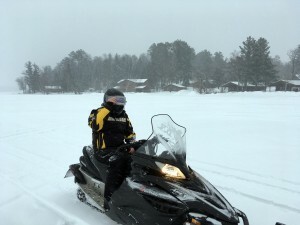 Itasca County has more than 1,000 miles of scenic snowmobile trails! Jay’s dad enjoyed his first day on the trails! 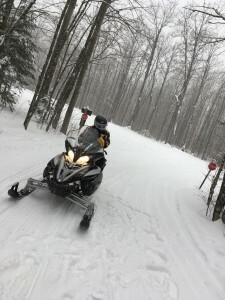 The falling snow made our snowmobile day feel magical!